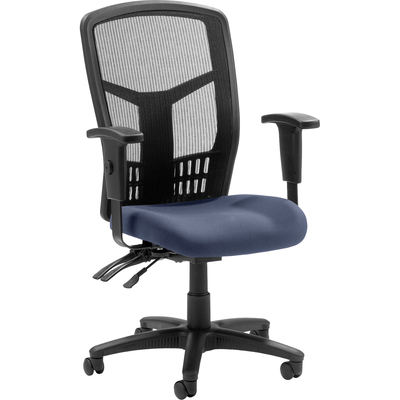 Executive High-Back Mesh Chair Cradles You During A Hard Day At Work With A Breathable Mesh Back And Mesh Fabric Seat. The Ergonomic Mesh Back Supports The Natural Curvature Of Your Back For Less Strain During Work At The Computer Or Meetings At Your Desk. Multifunction Control Adjusts Seat And Back Angles Independently With Two Levers For Infinite Locking Within A Fixed Range. For More Individualized Comfort, Arms Adjust In Height And Width, And The Seat Height From Floor Adjusts From 17" To 21". High-Back Chair Also Swivels 360 Degrees And Tilts With The Pivot Point Located Directly Above The Center Of The Chair Base. Five-Star Nylon Base Is Equipped With Smooth-Rolling Casters For Easily Moving The Chair Where Needed. Weight Capacity Is 275 Lb. High-Back Chair Is Available In Black Frame Only And Meets The Ca117 Fire-Retardant Standard..